Happy New Year to you all. I trust that we all had a wonderful festive season and are now set to face the new year with renewed vigor. We are thankful for the achievements and fruitful engagements that we realized in the past year with all our interlocutors. I take this early opportunity on behalf of the Government of Kenya and on my own behalf and that of the staff at the Kenya Embassy Berlin to congratulate Chancellor Angela Merkel for a historic re-election and the New Cabinet for being nominated into office. 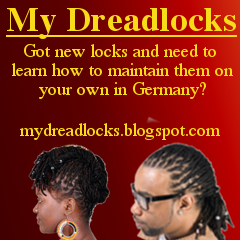 It is indeed a great trust and honour the German people have bestowed upon you. I wish you all the best in discharging your mandate. I look forward to fruitful engagement and interaction for the mutual benefit of our two countries and peoples. This year presents us yet again with another opportunity to enhance our longstanding relationship which marked its 50th Anniversary last year. As Kenya celebrated her Golden Jubilee Anniversary, so were our two Nations celebrating diplomatic and development relations that spans 50 years. We have witnessed historic milestones posted in both economic, political and social spheres. We have realized increased growth through our cooperation. I particularly appreciate the recent signing of our bilateral cooperation for the period 2014/2016 that saw tremendous increase in support on all our focal areas. This is significant and heralds yet another show of commitment and heightening of our cordial relations. We at the Embassy in Berlin are committed to selflessly propagate and promote our mutual interests. Whilst thanking the Business community for participating and visiting Kenya, attending various Business forums and conferences here in Deutschland and in Kenya, I call on you to seize the opportunity abundant in Kenya and invest. The Vision 2030 avails numerous opportunities in all sectors for investment. Our partners, the Chamber of Commerce and Industry, both national and state chambers, and the Business Associations have consistently been engaging with us to seek ways of serving the interests of members. I look forward to being in the same mode and even more to deliver on these expectations. Thank you Our Visitors, for considering Kenya as your preferred holiday destination. We shall endeavour to meet your dreams and surpass the same in this year and subsequent ones. I am happy to announce that we now have a single visa regime to enter three East African Countries namely Kenya, Rwanda and Uganda. I urge you to take advantage to not only sample what EAC offers in terms of tourism but indeed explore and prospect for investment opportunities. To my fellow Kenyans, thank you for the commitment to working together and forging a united view of purpose, that of building our beloved Nation. We are duty bound to nurture, protect and build our motherland from wherever we are. I urge you all in the Diaspora to redouble your participation in economic activities that will help build our Country. 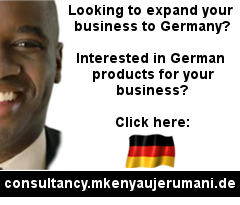 You have great opportunities to carryout business from Kenya to Germany. The range of products is wide and profitable. Seize the moment. I urge that the words of our National Anthem forever guide you every day. I look forward to more interactive sessions with the Embassy and among yourselves. My colleagues and I at the Embassy are committed to diligently serve all our interlocutors with dedication and professionalism and welcome your feedback as we endeavour to deliver effective, efficient and quality service. This is our solemn promise. Have a successful and enriching 2014. The Kenya Embassy Berlin hosted a Diplomatic Reception on 12th December, 2013, as part of the celebrations to mark Kenya’s Golden Jubilee Anniversary. 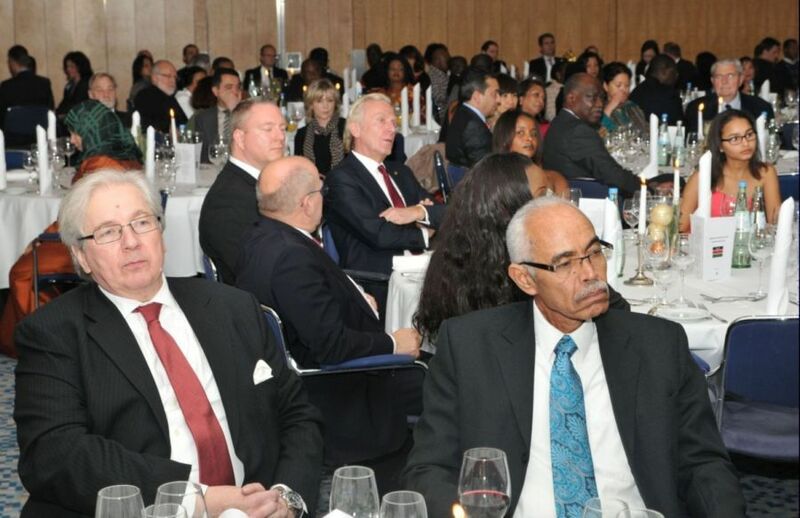 Over 200 guests, including a section of the Kenyan Diaspora, attended the function at Maritim Hotel in Berlin. Guests follow keenly the Ambassador’s speech at the Diplomatic Reception. Dr. Kamau Thugge, Principal Secretary in the National Treasury, shaking hands with Dr. Ralf-Matthias Mohs, Head of the East Africa Division, Federal Ministry for Economic Cooperation and Development, after signing the development cooperation on 10th December, 2013, in Nairobi. Also in the picture is H.E. 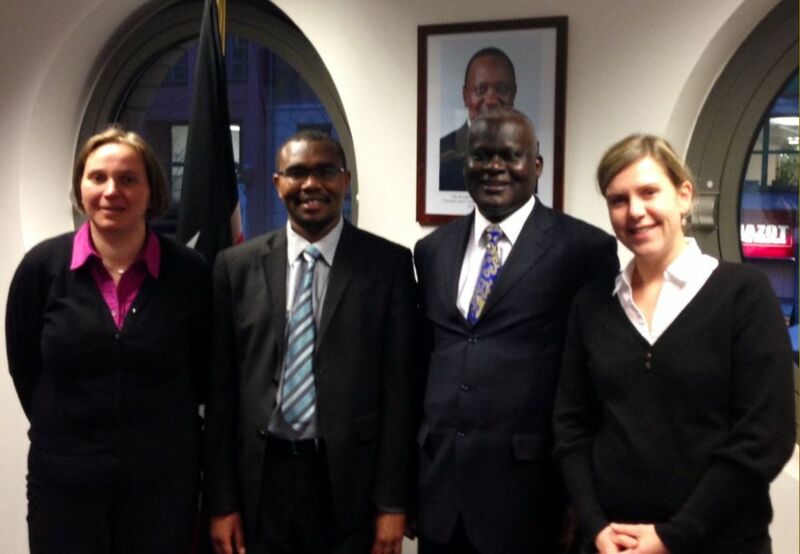 Ken Osinde, Kenya’s Ambassador to Germany (centre). The Government of Kenya and the Government of the Federal Republic of Germany signed a Development Cooperation Agreement on 10th December, 2013, in Nairobi. Kenya’s delegation was led by Dr. Kamau Thugge, Principal Secretary in the National Treasury, while Germany’s delegation was led by Dr. Ralf-Matthias Mohs, Head of the East Africa Division at the Federal Ministry for Economic Cooperation and Development. An International Ophthalmology Conference took place in Lübeck on 30th November, 2013. At the Conference, Dr. Mary Asiyo, a Kenyan residing in Germany, gave an overview of the Eye Care Centre at the Kisii Level 5 Hospital, which is part of the charity endevours of the eye clinic Augen Praxisklinik.The Centre’s aim is to eliminate avoidable blindness in Kenya and in particular South Western Kenya, South of Lake Victoria and beyond in line with the Vision 2020 global initiative for elimination of blindness under the World Health Organization (WHO). The Conference in Lübeck was attended by the Commercial attache, Mr. Oliver Konje, and the Second Secretary, Mr. Martin Wasike. Mr. Oliver Konje (Centre) and Mr. Martin Wasike (2nd Left) posing for a photo with Dr. Mary Asiyo-Vogel (Extreme Right) and a group of Doctors from Augenpraxisklinik in Lübeck. The Commercial attache, Mr. Oliver Konje, and the Second Secretary, Mr. Martin Wasike, paid a courtesy call on the President of the City of Lübeck on 30th November, 2013, to discuss a proposed twinning project between the City of Lübeck and the Kenyan town of Kisii. The idea was fronted by the Kenyan Doctor, Dr. Mary Asiyo-Vogel. 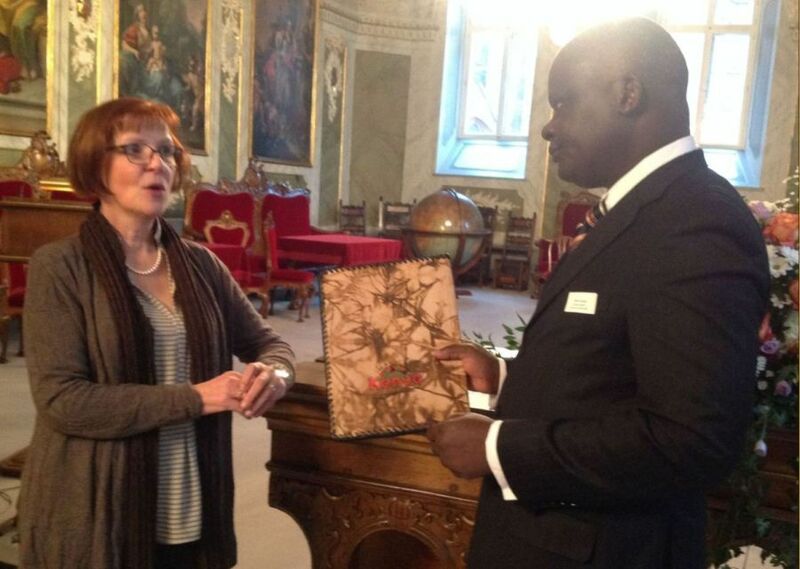 Mr. Oliver Konje presenting a gift to Mrs. Gabriele Schopenhauer, the President of the City of Lübeck. H.E. Ambassador Ken Osinde and the Commercial attache, Mr. Oliver Konje, visited Kenyan exhibitors at the Import Shop Fair. The event, held from 13th to 17th November, 2013, in Berlin, saw the attendance of a number of Small and Medium Enterprises from Kenya. Goods such as arts & crafts, clothing, jewellery and household textiles were on display at the exhibition. H.E. 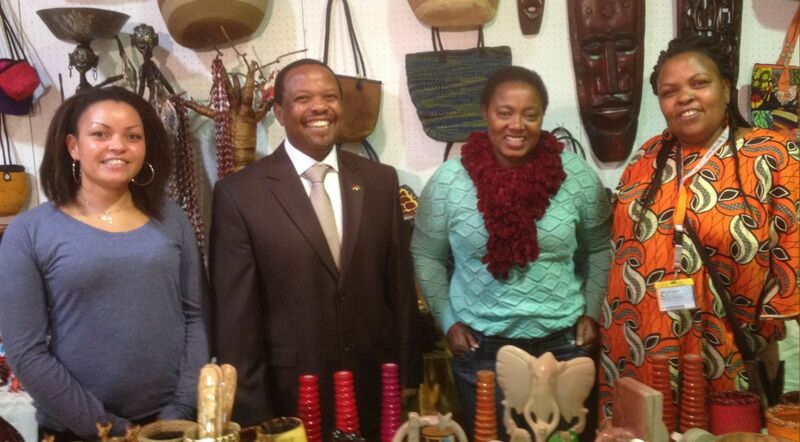 Ken Osinde with some of the Kenyan Exhibitors at the Import Shop Fair in Berlin. 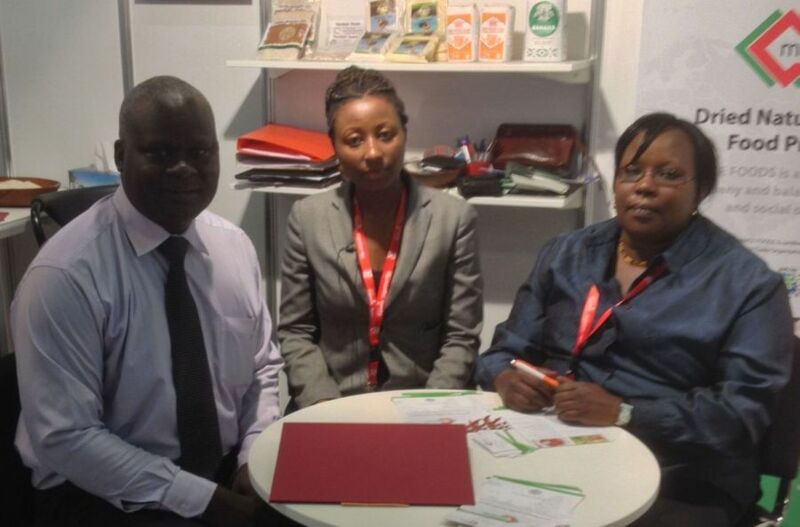 Kenyan companies Macefoods and Gold Crown Foods exhibited their goods at one of the largest and most important food and beverage fair in the world, the Anuga Food Fair, which was held in Cologne from 5th to 9th October, 2013. The Commercial attache, Mr. Oliver Konje, was at the Food Fair and visited the Kenyan exhibitors. Some of the Kenyan businesspeople at the Food Fair included: Ms. Margaret Komen, the Managing Director of Macefoods; Mr. Naveed Ariff, the Director of Gold Crown Foods; and Ms. Sylvia Mbaabu, the Market Information Systems Manager of Fintrac. Mr. Oliver Konje reading the Keynote Speech on behalf of H.E. the Ambassador. 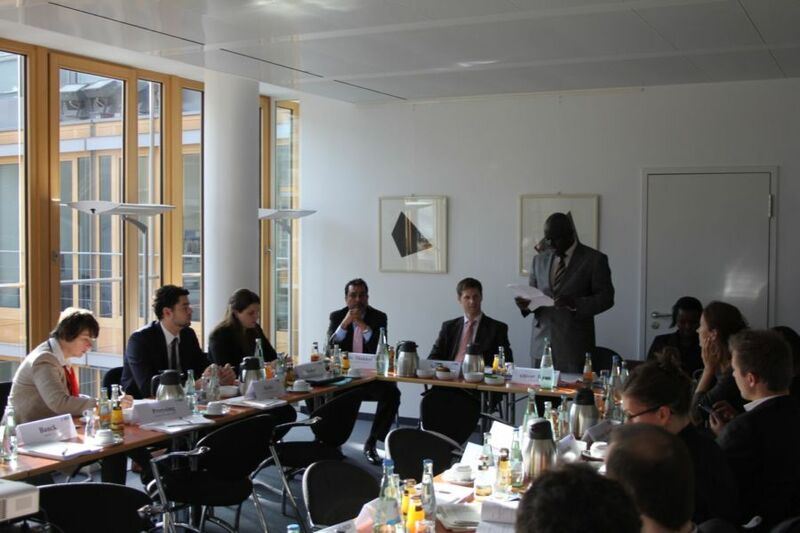 On 29th October, 2013, the Kenya Embassy Berlin participated in a Workshop entitled “Kenya Healthcare Day”, organized jointly by the Federal Ministry for Economic Cooperation and Development (BMZ) and the Federation of German Industries (BDI). The objective of the Seminar was to sensitize German health sector players on the investment opportunities available in Kenya. The Embassy was represented by the Minister Counsellor, Mrs. Rosemary Owino, the Commercial attache, Mr. Oliver Konje, and the Second Secretary, Mr. Silvester Koech. 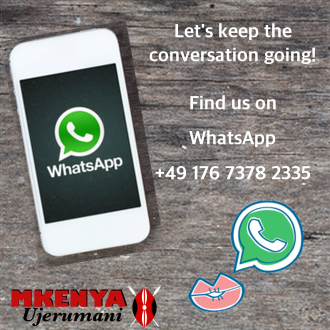 Kenyan speakers invited to the Forum included Dr. Amit Thakker, the CEO of Unicare Holdings Ltd., and Ms. Jacinta Mutegi, the National Executive Secretary of the Catholic Health Commission of the Kenya Conference of Catholic Bishops. H.E. 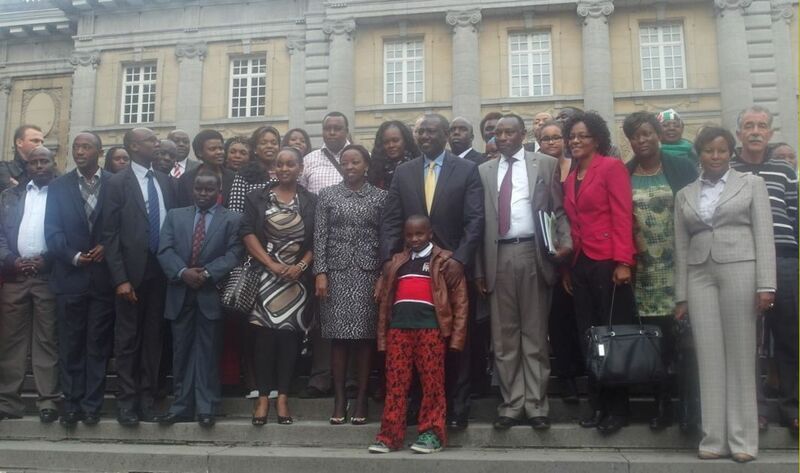 the Deputy President, William Samoei Ruto, with a section of Kenyan Diaspora from Germany who attended the Mashujaa Day service in Brussels, Belgium, on 20th October, 2013. Also in the picture is the Kenya Ambassador to Belgium, Amb. Johnson Weru, and Mrs. Rosemary Owino, the then Chargé d’ Affaires, Kenya Embassy Berlin. 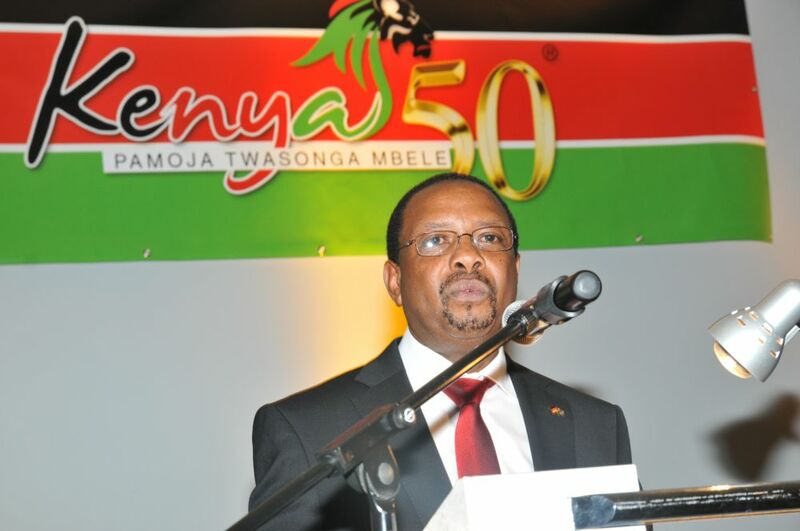 A thanksgiving interdenominational service was held in Brussels, Belgium, on 20th October, 2013, in the presence of Kenya’s Deputy President, H.E. William Samoei Ruto. 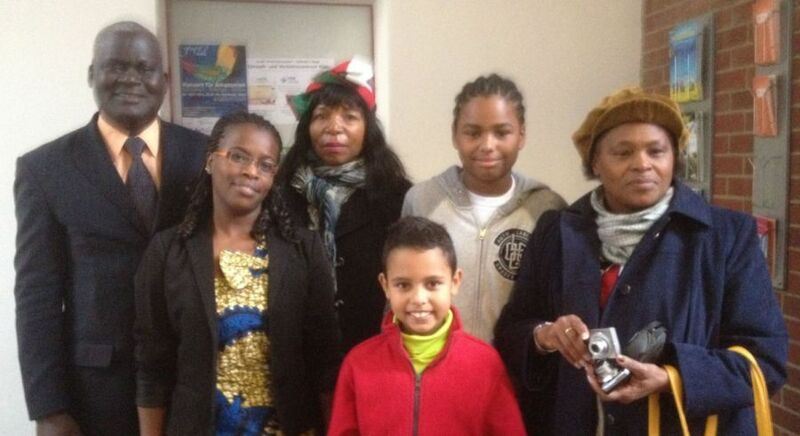 The event was attended by a section of the Kenyan Diaspora living in Germany. The Kenya Embassy Berlin was represented by the then Charge d’ Affaires, Mrs. Rosemary Owino. 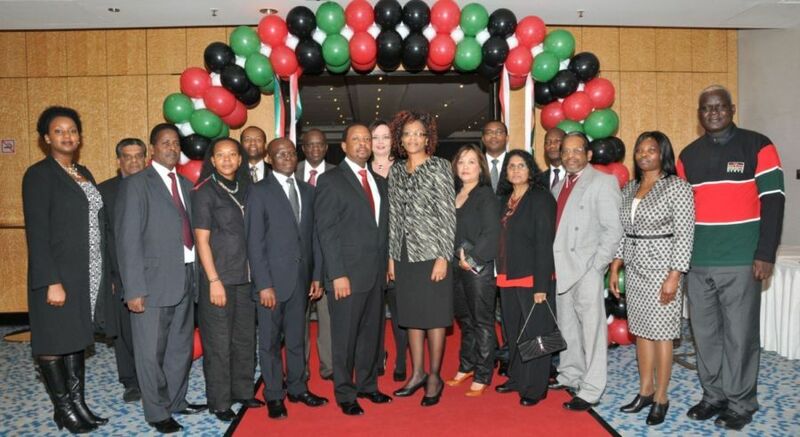 The Kenyan Diaspora in Cologne celebrated the Golden Jubilee Anniversary by organizing various activities in their City. The events, which took part from 22nd to 24th November, 2013, included a Forum where presentations were made by individuals who had excelled in business and charity. Other events included a fashion show and a church service. Kenya Embassy Berlin was represented by the Commercial Attache, Mr. Oliver Konje, and Second Secretary, Ms. Redempta Ndambuki. 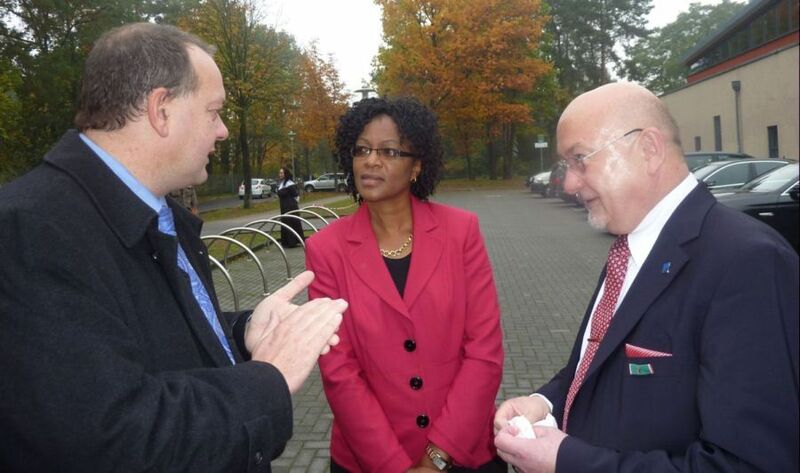 Minister Counsellor, Mrs. Rosemary Owino, talking with Prof. Prof. László Ungvári, the President of the Technical University of Applied Sciences, Wildau (Right) and Prof. Thomas Gath, Director, School of Engineering (Left), before the graduation commenced. Hundreds of students from the Technical University of Applied Sciences in Wildau, graduated on 12th October, 2013. Mrs. Rosemary Owino, Minister Counsellor and Mr. Silvester Koech, Second Secretary, attended the graduation at the invitation of the University President, Prof. László Ungvári. 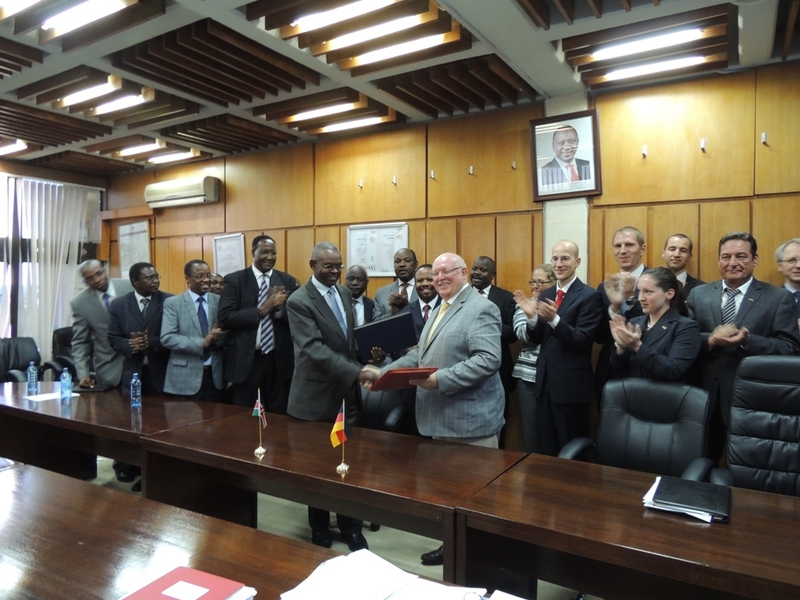 In 2013, the Technical University signed a co-operation agreement with the Dedan Kimathi University of Technology. Commercial Attaché, Mr. Oliver Konje and Second Secretary, Mr. Silvester Koech, posing for a photo with Schubart Gymnasium teachers, Ms. Bettina Schönherr (Left) and Ms. Laura Höwel (Right). Teachers from the Schubart Gymnasium visited the Embassy in November, 2013. The two teachers from Aalen are interested in establishing a partnership with a Primary School in Kenya. Aalen is a City located in the eastern part of the German state of Baden-Württemberg, about 70 kilometres east of Stuttgart.